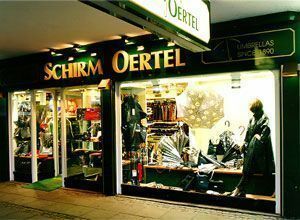 Schirm Oertel is the largest specialised umbrella shop in Germany and one of the oldest specialty shops in downtown Bremen. After the transition of the company into a focused and extremely specialised retail firm, we have achieved a position unique in Germany with our comprehensive product offering. We’ve had an Internet presence since 1998 and deliver to customers throughout the entire world. We carry an international line of all top products from Italy, France, England, Austria and Germany, as well as imports from the Far East. We’re also specialists for umbrella models made by Knirps. Our top-end price segment includes the designer products of, Moschino, Guy Laroche, Gianfranco Ferré, Ayrens/Paris, Fornasetti, Il Marchesato and Brigg’s of London. We can also supply you with promotional umbrellas with your company logo, in all price ranges. 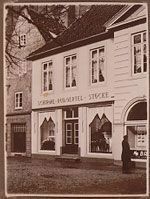 A good 129 years ago the Rudolf Oertel Co. (today Schirm Oertel; "Schirm" is German for "umbrella") was founded in Bremen as an umbrella factory and specialist shop. The first location of this highly specialised firm was on the Obernstrasse, the most important shopping street in downtown Bremen.The retail store was located in a strikingly classic-style building next to the famous St. Ansgari church. The company’s core strength was wooden handle turning and the manufacture of wooden shafts for sun and rain umbrellas. It also made shafts for walking sticks. Through the invention of the telescoping pocket umbrella and the start of the "Original Knirps" as the first important worldwide umbrella brand, the market for umbrellas underwent radical change. The umbrella became an industrially manufactured product coming off of a production line. The successors to the founding generation recognized the changed market situation just in time before the world economic crisis began. They ceased their own manufacturing activities, expanded their main retail business in the downtown area, and opened a chain of shops elsewhere in Bremen. In 1944 the shops were destroyed, but sales continued from sheltered sites in the city. The location on the Obernstrasse was maintained up until 1984. Following the acquisition in 1984 by the current owners, Dorrit and Rainer Gramke, and the decision to move the company to the more exclusive Sögestrasse, the focus shifted increasingly to offering a strong line of fashionable designer products. Nowhere else in Germany is a comparable inventory available. In addition to all the key designer labels, sales were expanded of high-quality umbrellas under the name "Oertel Handmade" and bearing Bremen’s key motif coat-of-arms. These umbrellas are made in cooperation with the Franceseco Maglia umbrella company in Milan. The breadth of technical knowledge, the Hanseatic tradition, and the extreme degree of specialisation all have not prevented the company’s management from making use of the Internet as a new sales channel. It began already in 1998 with the sites at "www.regenschirme.de" and “www.european-umbrellas.com”. The website is updated virtually on a daily basis and continuously being expanded - and is among the best on the net according to our customers. A small company which places value on tradition has shown that it has mastered the transition to the next century through the use of modern technology. Today we’re shipping umbrellas to website customers in the USA, Russia, Australia, South America, Asia, Switzerland, and the entire EU. After 129 years of competence in dealing with umbrellas, a traditional yet still youthful company is thriving and open for business in a changing marketplace.